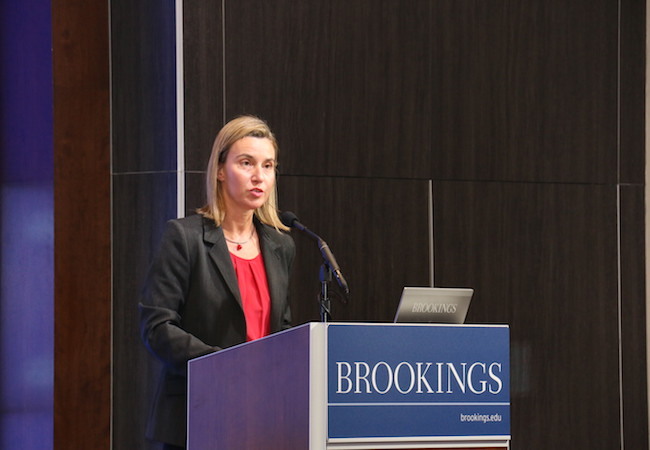 ‘Terrorist groups must not spoil the process and the ceasefire must be preserved,’ says EU foreign policy chief. EU foreign policy chief Federica Mogherini has urged the Turkish foreign minister to pursue efforts to preserve the cease-fire with the illegal Kurdistan Workers Party, according to a statement issued Saturday. Mogherini spoke over the phone on Saturday with Turkish Foreign Minister Mevlut Cavusoglu, reaffirming the support for Turkey’s efforts against Daesh. The phone call comes as Turkey has launched air attacks against Daesh and the Kurdistan Workers Party (PKK), which is listed as a terror organization by the EU, the U.S. and Turkey. On Friday night and Saturday, Turkish air forces bombed, for the first time in the last two-and-a-half years, PKK camps in northern Iraq. Turkey also launched this week attacks against Daesh in Syria. Turkey’s attacks on the PKK come after a new wave of attacks against Turkish security forces in the country’s southeastern regions is believed to have been carried out by the outlawed organization. The new wave of tension is feared to pose a severe blow to what is known in Turkey as the “solution process”, during which the PKK declared a cease-fire in 2013. The “solution process” was launched to end the decades-old conflict with the outlawed PKK, a dispute which has claimed the lives of more than 40,000 people over more than 30 years in Turkey. “The Turkish government has shown courage, firm intention and wisdom in recent years in bringing forward a political process that is the only means of reaching a stable solution to the conflict, for the sake of all the Turkish people,” said the EU statement. “The EU will keep supporting the government on this path,” it added. Mogherini also offered EU condolences to the Turkish government and the families of the victims in Suruc and of other recent attacks against police and military officers. Thirty-two people were killed in Suruc district of the southeastern Turkish province of Sanliurfa on Monday in a Daesh-suspected suicide attack. This and other attacks on security forces led to the anti-terror operations in Turkey, which saw a total of 590 people, including at least 37 foreigners, detained. They are suspected of having ties with terrorist groups.